Kind Hearts and Coronets: buy one Alec Guinness, get seven free! 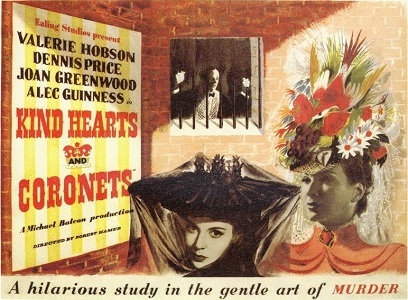 We had a bit of a debate before this podcast over whether Kind Hearts and Coronets counts as ‘obscure’. Although we love finding out about underrated classic films, part of the reason we started this podcast was to have an excuse to watch some of the relatively ‘big’ films that have somehow passed us by – in particular, there are quite a few major Hollywood movies that somehow seem to have eluded Ian (Taxi Driver and Apocalypse Now to name just two – watch out for podcasts on those soon). We suddenly realised this week that as we’re nearly a third of the way through our list, we’d better make sure we leave room to cover all of the ‘big’ films as well as the oddities. So does Kind Hearts and Coronets count as a ‘big’ film or an undiscovered classic? I’d certainly never heard of it until reading a Guardian article that sung its praises last December, but since then it’s been recommended to us (thanks Hannah! ), and a few other people have mentioned how good it is. It’s funny how this one completely passed me by, especially as I’m a big fan of other Ealing comedies like The Man in the White Suit and Passport to Pimlico, but I’m very glad I’ve seen it now: it really is a wonderful film. Alec Guinness is truly superb in his multiple roles as eight different members of the D’Ascoyne family, and it’s impressive how he gives each one a memorable and individual personality without resorting to caricature. Equally amazing is Dennis Price in the lead role of Louis Mazzini, who manages the impressive feat of somehow making you root for the murderer. And then there’s the lovely Joan Greenwood: there we were thinking that Felicity Kendal was the sexiest woman to ever stalk the earth – turns out she has a rival. I swear her voice could calm riots.